I know there must be readers who are weary of all the renditions of Yordie’s Zen Garden. Did you know that this year alone there have been two YZGs preceding the new one at Harborgrove? And in total, since 2007, six YZGs have come and gone since Harborgrove. Of course, this is Second Life and things are more transient than in real life; even many of the places in my Wonders of Second Life list undergo change year after years. Yes, I know they don’t move all the time, so let’s say I have some things to work on. And hey, some places never change and just get old; in SL, when things don’t change they start looking old very quickly (I’m certain that every woman in SL knows what I mean). Since moving to the new half-homestead sim, I’ve been working on the garden. And in the few weeks the garden has begun to reveal itself to me. So, I felt it was time to shoot some photos and sent out an invite to members of the garden group to come take a peak at the new place. Please keep in mind that I am still a long way from being satisfied with the current state, but I think the basic ideas are built-in now. Here’s a panorama centered on the inlet from the sea into the stream leading to the pond. And here’s a view of the path that leads to the Zen garden area. This garden is built on twice the land as the past two gardens, so it’s having some growing pains fitting into those feet. In order to give the garden a signature look I’m sinking a lot of the land into the sea, extending mountains and hills and creating space for the palace Taka built for me. I expect the new garden to be completed this month and hope you’ll keep an eye out for the opening. 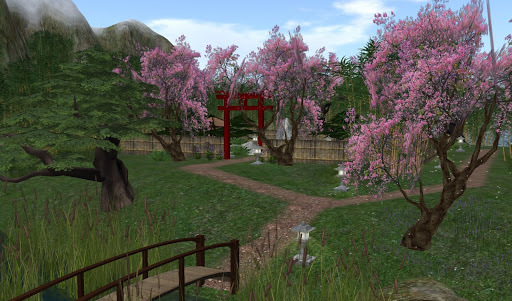 This entry was posted in Features and tagged Geisha & Samurai, Homes & Gardens, Photography, Second Life. Bookmark the permalink.